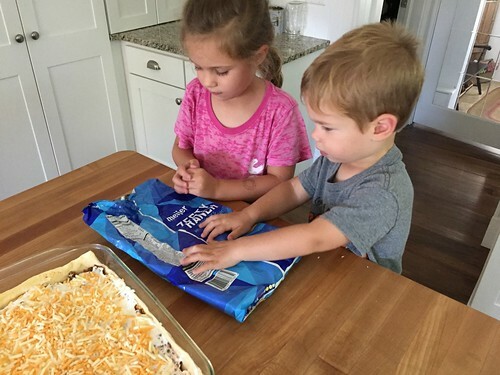 I’m back with another Kids in the Kitchen post today — and honestly, this recipe is so simple, even a very young child could help. 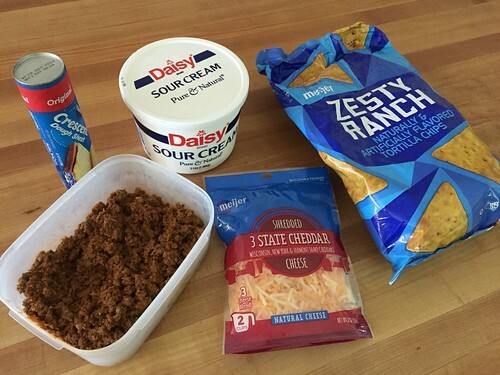 My kids LOVE taco meat, they love cheese, and they loves Doritos — so this meal is always a big hit with them. 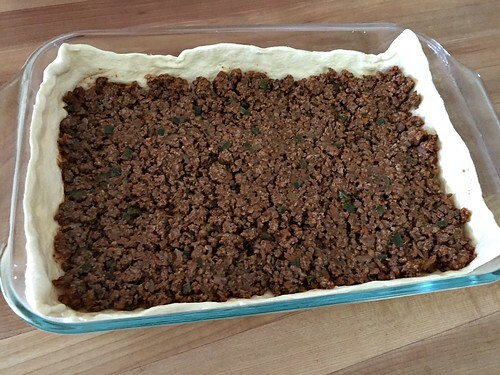 Of course, I love the fact that if I have taco meat made up ahead of time (which I usually do) it only takes me 5-10 minutes to have this meal ready for the oven, and only another 20 minutes to bake. I whip up a couple of salads and clean up the kitchen while food is in the oven, and I can literally have dinner on the table in less than 30 minutes! 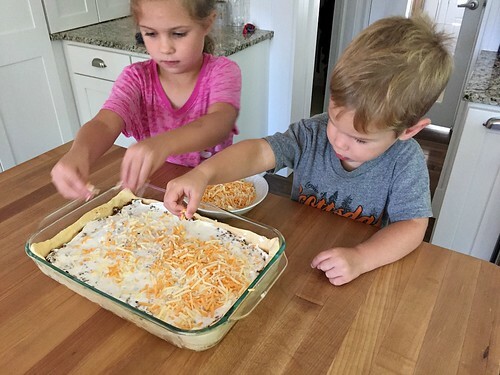 Taco casserole is one of my favorite quick-meal options for busy weeknights — plus, the kids love that they can help. **I usually make my taco meat with diced onions and pepper. I only use 1/2 c. water to mix in with the taco seasoning and sub in 1/4 c. taco sauce for the other 1/4c. water (see photo below). 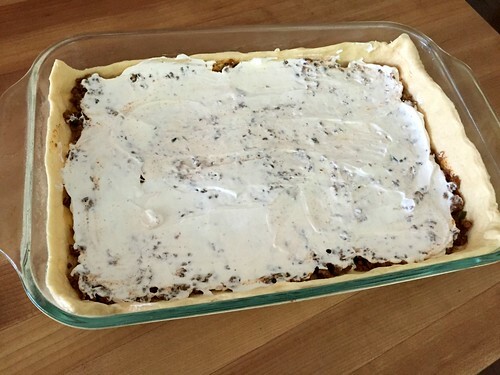 Spread sour cream over meat mixture and then sprinkle cheese over that. 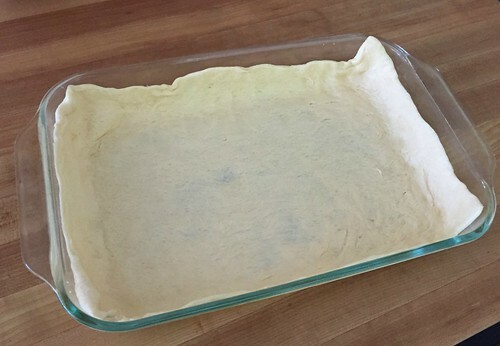 The rest of the meal is so quick and simple to throw together that, as I mentioned above, you can have it ready for the oven before your oven is even preheated! What are your favorite 30-minute recipes? I watched a cute “cooking with kids” Youtube that made me think of you. I don’t know if you allow links, so I’ll just tell you about it. It’s the recent “homemade crustables” on Do It On a Dime. 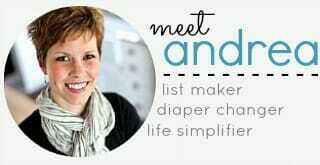 She does videos cooking with her son. So cute! I’ll have to look it up. Thanks!! I absolutely LOVE simple meals like this. And honestly, the simpler meals are generally the ones my kids like best, too! I’ll be trying this very soon, thanks for the recipe! yup, my kids too! In fact, the meals they like the best are just meat and potatoes but I can’t always make that ahead of time, so we do a lot of casseroles! We will definitely be trying this thanks so much! I make this all the time for my family. 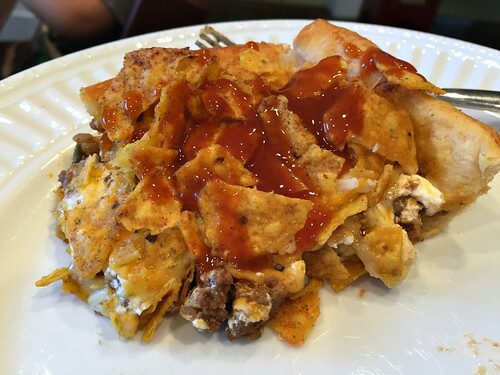 I do not put the sour cream on it though as some do not like it so it is served in the side with other toppings. I also just use plain tortilla chips. I never thought to use ranch ones. 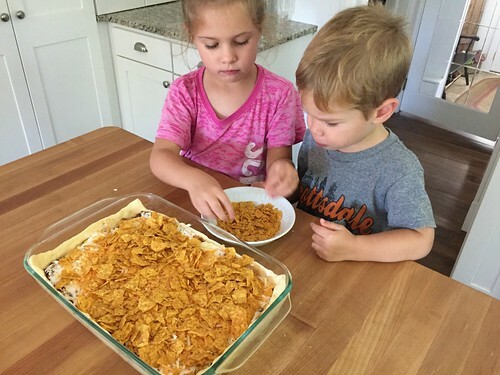 We have used nacho cheese ones as well. 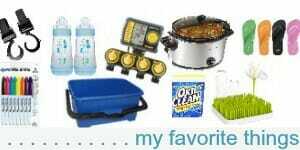 I also love it that your children will help and eat with enjoyment almost all the the meals you make. I believe one of the main reasons they enjoy different meals is just that — they got to help make it! That looks so yummy! 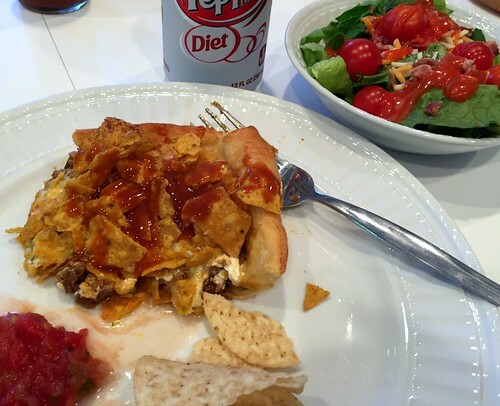 I love that your kids will eat it……..my 8 year old will not eat taco meat. Preparing cooked meat and freezing has been a game changer for me. This recipe reminded me of a recipe I used to make years ago ~ I just googled it and found it. 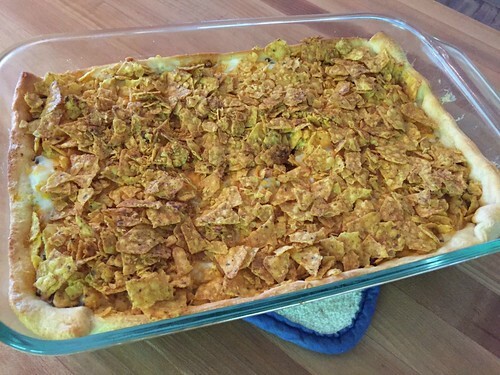 Charles Gibson’s Enchilada Casserole. Soooo good ~ I can’t believe this ever got taken out of my meal rotation. 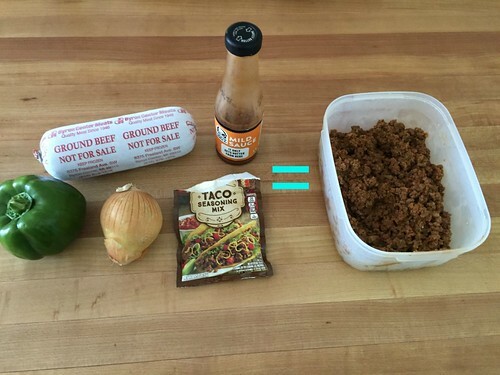 I was somewhat surprised my kids liked this recipe as much as they did — because our taco meat was actually relatively spicy! Also, I’m glad you were able to Google your recipe 🙂 Put it back into your meal planning rotation ASAP! 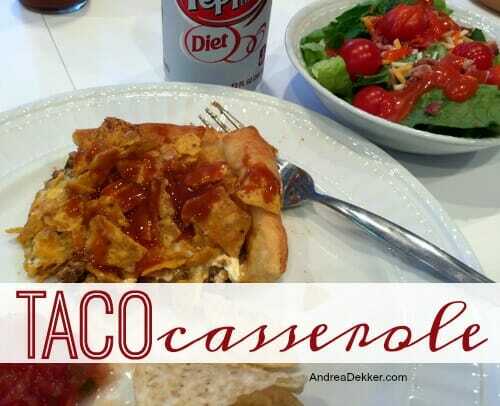 We make this taco casserole too. 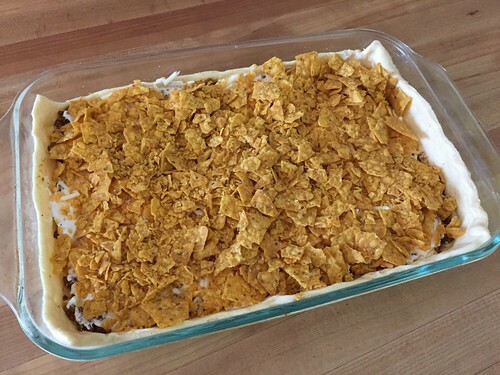 Usually, I make a ton of taco meat when we have tacos and then a few days later, I make this casserole or we have nachos (if I haven’t frozen the meat yet). I also freeze plain cooked ground beef, then I can whip up spaghetti casserole, sloppy joes, hamburger helper or whatever really quickly, also. yes yes yes! We have LOTS of already cooked and pre-portioned meats in our freezer (ground beef, sausage, shredded pork and chicken, taco meat, etc.) This is a huge time-saver for me on a regular basis!